The Smart Bro pocket Wi-Fi, like other devices of its kind uses a default network name and a general password. This poses the risk of having unauthorized users connect to your WiFi without permission if they know the usual password for this type of network. So here's a tutorial on how to change Smart Bro pocket WiFi username and password to make your network more secure. First of all, make sure you are connected to the right network. 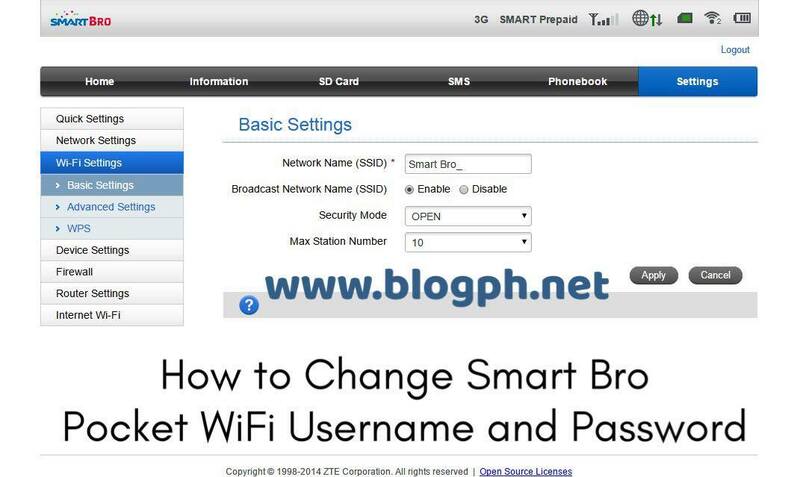 Once you're redirected to the Smart Bro dashboard, click Settings and then Wi-Fi Settings. You can change the WiFi name (Network Name/SSID) and password (Pass Phrase) under Basic Settings. Don't change anything else to avoid messing up your connection. Here's a bonus feature. You can find out how many devices are connected to your WiFi through the SD Card tab. Under Device Information, see if there's any device that you don't recognize and disconnect it. You can also use the modem to send/receive messages using the number assigned. There's a Phonebook to save contacts and the SMS tab for messaging. It's also where you can reload the account (for Prepaid), check balance and register for various data promos.